Harry Styles and Luke Hemmings are among the most popular young guys in the music industry right now. With Harry Styles being a member of One Direction and Luke Hemmings a member of 5 Seconds of Summer. 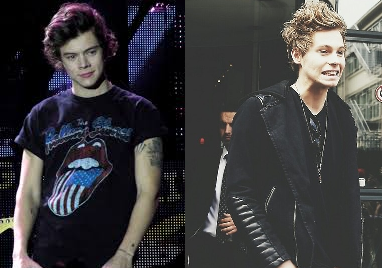 Now, because this is an all about height website, who is taller Harry or Luke. Check out our own estimate of Harry Styles' height here on our website. Some website's, blogs, forums, and social media says Harry is 6'3" inches tall and some say Luke is 6'4" tall. Are these height listings really true? Many of us are puzzled if these listings are their real height. If they were these tall then why do they seem to look the same height as their not so tall listed band-mates? Harry being listed as 6'3" would be not so believable when you see photos of him with his band-mates who were all listed below 6 ft. Same goes for Luke Hemmings. Luke's mates all seem to be as tall as he is, if not, maybe atleast 1-2 inches shorter. If Luke is really 6'4" inches tall then, based on photos, his band-mates would be above 6 ft too. There is a photo in the web where One Direction and 5 Seconds of Summer were together and they all do look as of the same height. How about you? Where do you stand? Is Harry taller than Luke? Is it the other way? Or are they of the same height? 5sos are said to be 6ft tall. All of the 5SOS members are over 6ft tall. All of the 5sos members are slightly underneath 6ft (5'10-5'11"), and all the 1d members are all within average range (5'7"-5'9"). Luke is a little taller basically..